Variegated plants add variety to the landscape. Trees, shrubs, herbs, flowers, vines and even pond plants come in variegated forms. When planted in shady locations, these garden gems brighten dark places. Used in mass plantings they provide a foil for other species. Take care with some variegated species, as they require protection from the sun. 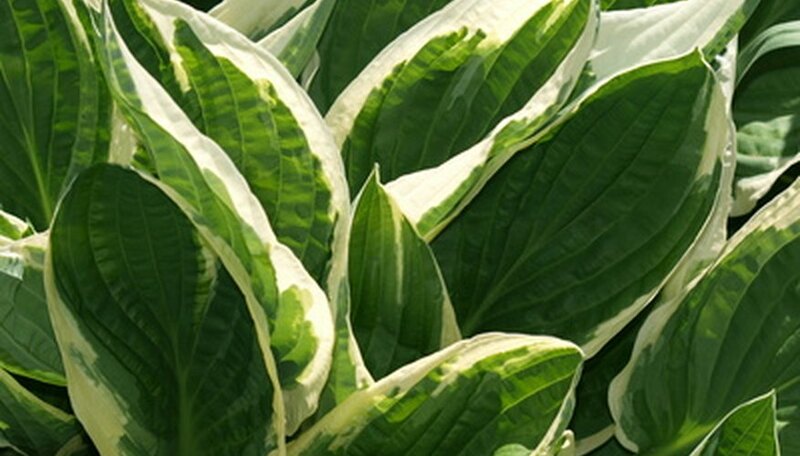 Choose hosta "White Feather" for its unusual habit of emerging white and then gradually turning green. Its flowers are pale to medium purple. A bit more delicate than other hostas, "White Feather" needs protection from the harshest of the sun’s rays. Plant this hosta in humus rich soils. As with other hostas, "White Feather" loves moisture and will even grow well as a pond plant. Feed with a slow-release fertilizer as per the manufacturer’s recommendations. When purchased bare root, soak the entire plant in water for several hours--this ensures the plant gets off to a good start. Plant the variegated maple (Acer campestre) "Carnival" to brighten shady areas. This is a small tree, growing to around 12 feet in height. Its small stature makes it suitable for little yards but it looks equally good when planted on larger tracts of land. The foliage has a habit of forming a ball shape before unfurling to maple-typical leaves. New growth is pink before turning white and green. Plant this maple in full or dappled shade. As with others of this family, provide humus rich soil that holds moisture without becoming sodden. Apply a thick layer of mulch to the base to prevent weeds and keep the soil from drying out--avoid touching the trunk with mulch. When newly planted, use a slow-release fertilizer as per manufacturer’s directions. Once established, feed with a 10-10-10 fertilizer monthly. Grow bittersweet as a quick ground cover, trained as an unusual shrub or allow it to vine. Its strong limbs and thick habit make it an ideal plant for animal cover. Birds eat the bright orange berries each fall, through winter. Keep in mind that oriental bittersweet (Celastrus orbiculata) is a highly invasive plant. Plant your bittersweet vine in sand, clay or loam soils. Apply a thick layer of mulch to conserve moisture and give it a neat appearance. Bittersweet twines tightly around other plants so take care when planting it. If the plant becomes unruly, simply cut it back--to the ground if need be. Feed with slow-release fertilizers, worm castings or mushroom compost.